We Love Italy | Sprezzatura, Y'all! Yesterday we had the kind of day that reminds us of why we’re here. 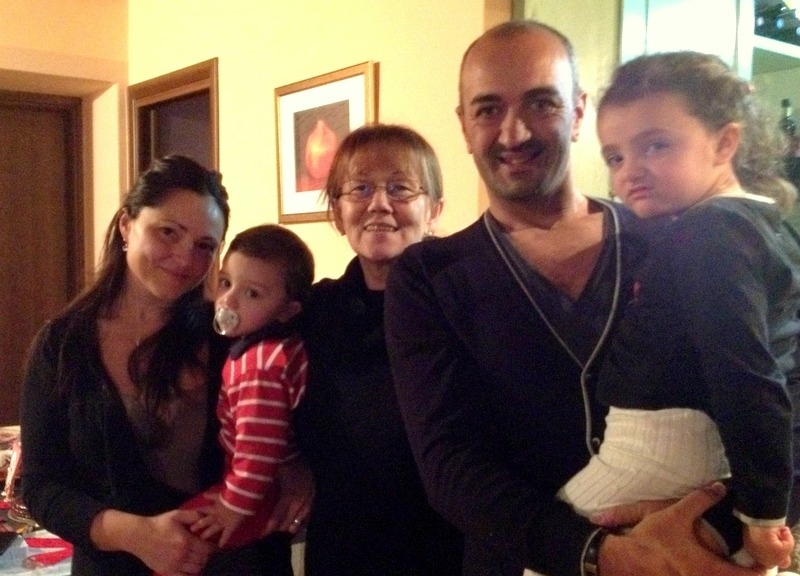 We went to Perugia, which is about 45 minutes away and had lunch with our dear friend Ludo and his wife Sonja. We’ve known Ludo for over 12 years and think of him like family. He was a young, single Italian when we first met – not interested in settling down, getting married or having a family. We’ve watched him do all those things since. He’s married to Sonja, who is from Croatia, and has two delightful children, Chole, 4, and Gioele, 2. Sonja’s mother was there visiting from Croatia, so we got to meet her as well. Ludo has cooked for us many times both in the U.S. and in Italy. He’s a very good cook, and so is Sonja, so we knew we were in for a treat. We didn’t know her mother was going to be there, so that was an added food bonus for us. They divided up the meal and each took a dish. 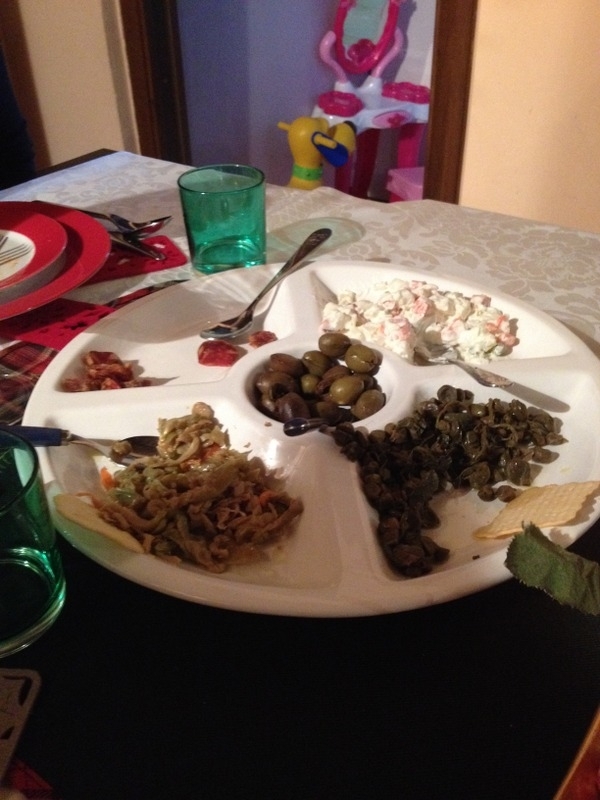 The appetizers were a combination of Croatian and Calabrian, the region of Italy where Ludo is from. Pickled eggplant, olives, homemade sausage from Ludo’s mother, a great fish spread with red peppers and ricotta cheese, capers – a great start. Ludo is a wine exporter, so he knows Italian wine very well and had paired each course with a wine. We felt like we were in a five star restaurant with a sommelier. After the appetizer we had a beet soup that was wonderful. 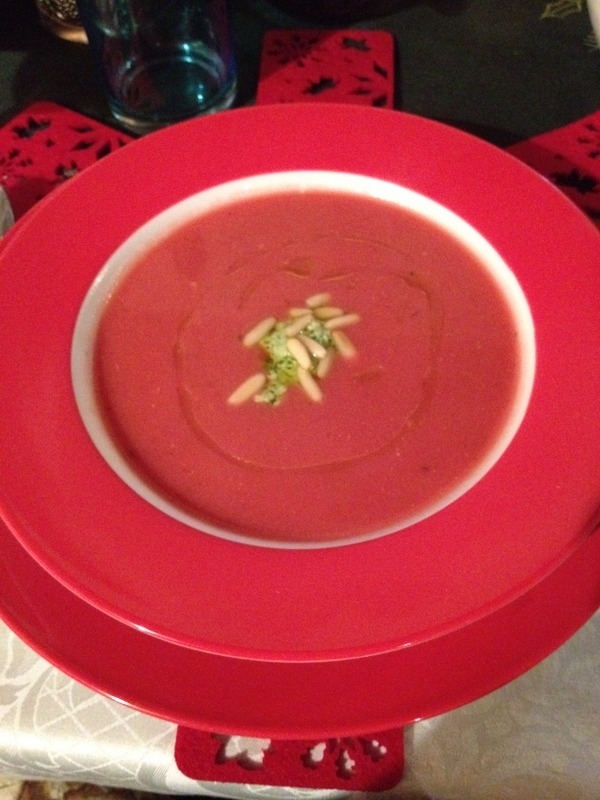 This was a traditional Croatian soup that Sonja has taken and turned into something that neared perfection. It was a blend of earthiness, creaminess, and pungency with beets, potatoes, olive oil, pine nuts and pesto. Then homemade gnocchi. Sonja’s mother made it and I am a big fan of gnocchi. Sometimes gnocchi can be very heavy and dense – these were like little pillows. Light and fluffy not doughy at all. 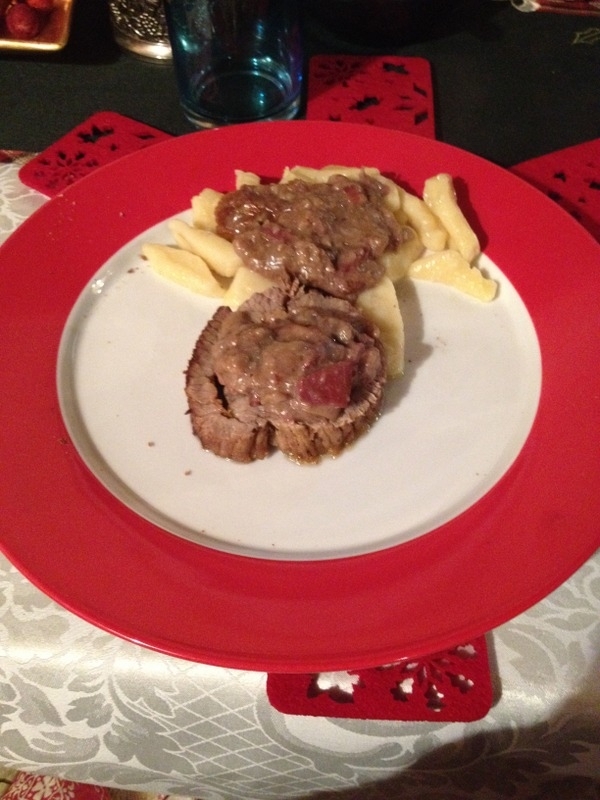 The gnocchi were accompanied by a veal roast with a porcini mushroom sauce that Ludo made. It was a classic and divine combination that made us very happy. And the wine made it even better. Ludo had some wine from some very small vineyards that you have trouble finding even in Italy. 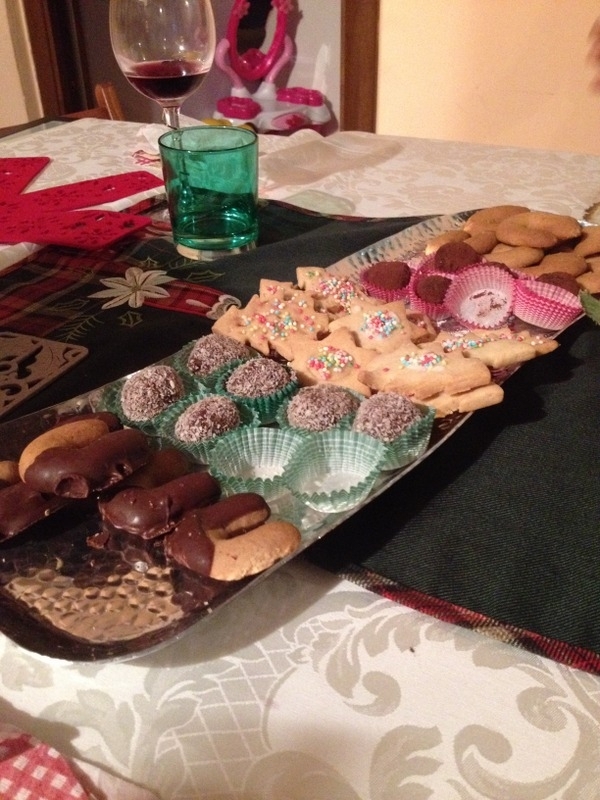 For dessert, Sonja’s mother and Chloe had made truffles and cookies and I brought a Sacher Torte from the bakery in Anghiari. Ludo had a dessert wine and grappa that went with everything perfectly. We got there at 1:00 and got up from the table at 6:00. As we said our goodbyes, we realized how lucky we are to have this opportunity to spend time with people we know and love. We made plans for them to come to Anghiari before we leave. As we were talking it through, it hit us that we only have about five more weeks here. Wow – that’s hard to believe. When we got back to Anghiari, we took a walk through town. The sports bar that we go to was having a street party, complete with a pig roast. One of the butchers was there carving up pieces that were thrown on a big open wood fire. Another fire provided the coals to make the temperature just right. A band played over to one side and tables and chairs were set up all along the street and sidewalk. Wine was flowing and everyone was having a great time. We chatted with some Australians that had just arrived and would be here for two weeks. We shared some of our pointers with them and they said how envious they were that we were having this wonderful experience. We looked at each other and nodded. We are very lucky. We’d just had the perfect day in Italy. We look forward to it, too. The days are going by so fast now – we must schedule it soon.